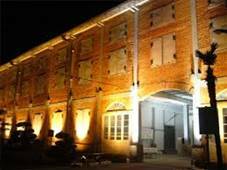 Tomioka Silk Mill (TSM) is a large-scale mill complex which facilitated the first model machine silk-reeling mill built by the Meiji government. 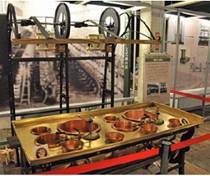 It was a pioneer in the modernization of Japanese industry and significantly contributed to the improvement of the silk industry in Japan. Railway: “Joshu Tomioka St.” on the Joshin Dentetsu Line. Road Access: About 10 minutes driving from the Tomioka interchange of Joshinetsu Motorway. 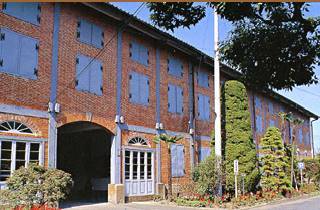 Tomioka Silk Mill is the first model silk-reeling factory which Japanese government established in 1872. At that time, the most important Japanese export to the West was raw silk. 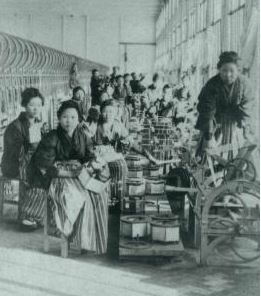 However, because raw silk was produced by hand, the sufficient quantity of goods couldn’t be produced to meet export demand.Then, the government decided to set up a model factory equipped with modern silk-reeling machines from Europe under the guidance of Western engineers in order to enable mass-production of high-quality raw silk, and trained Japanese people in the techniques of machine-reeling and hoped them to be leaders in the silk factories throughout of the country. 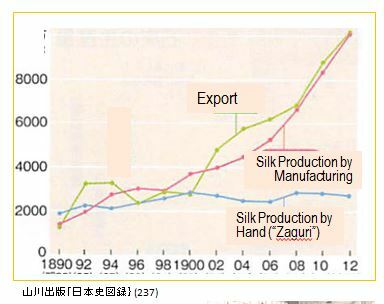 As a result, Japanese silk industries were developed fast and increased the export of silk in the world. 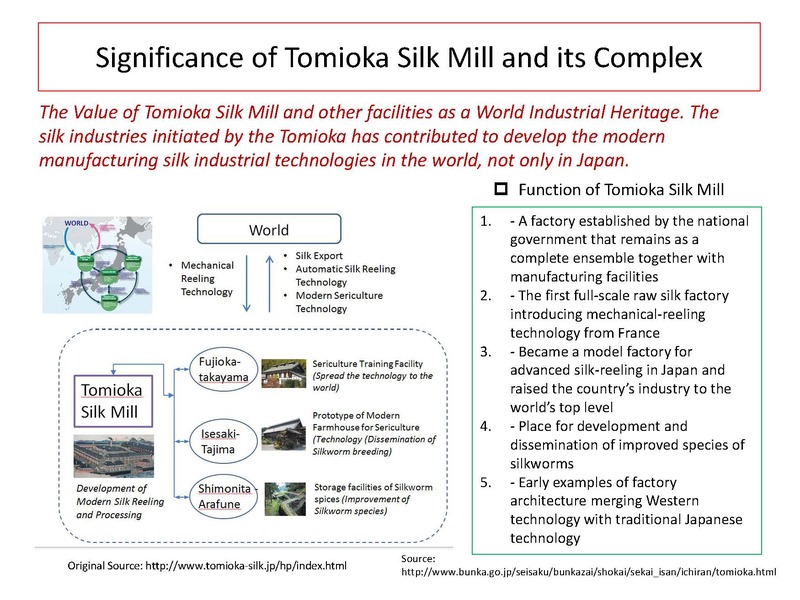 How the Tomioka Mill has been created, and who are contributed to the operation. 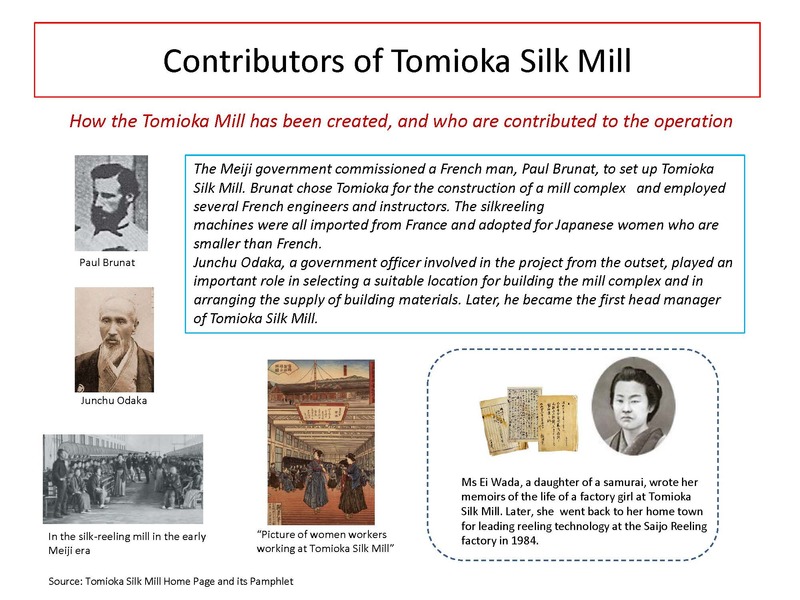 The Meiji government commissioned a French man, Paul Brunat, to set up Tomioka Silk Mill. Brunat chose Tomioka for the construction of a mill complex and employed several French engineers and instructors. The silkreeling machines were all imported from France and adopted for Japanese women who are smaller height than French. Junchu Odaka, a government officer involved in the project from the outset, played an important role in selecting a suitable location for building the mill complex and in arranging the supply of building materials. 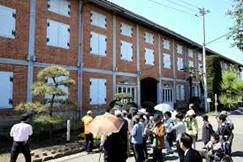 Later, he became the first head manager of Tomioka Silk Mill. 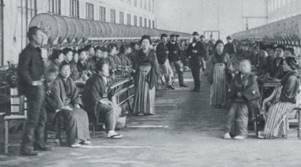 Ms Ei Wada, a daughter of a samurai, wrote her memoirs of the life of a factory girl at Tomioka Silk Mill. Later, she went back to her home town for leading reeling technology at the Saijo Reeling factory in 1984. 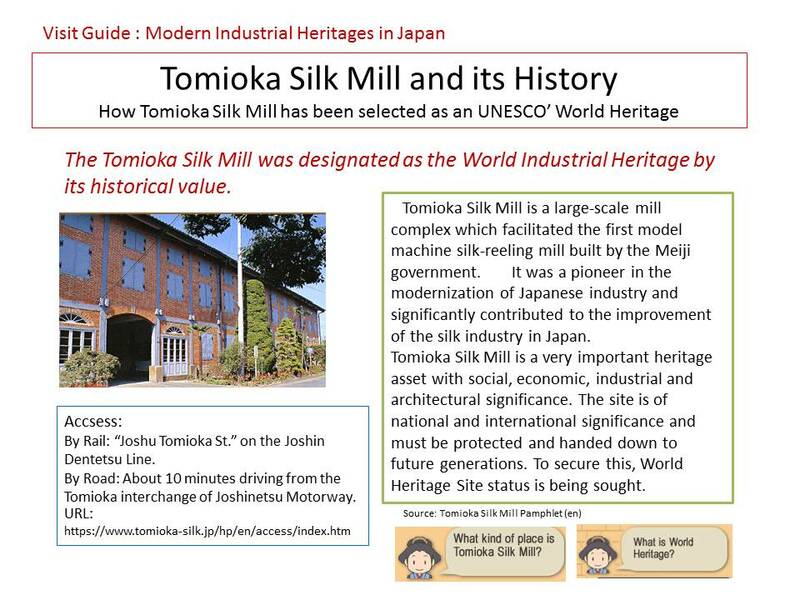 The Value of Tomioka Silk Mill and other facilities recognized by UNESCO as the World Industrial Heritage. 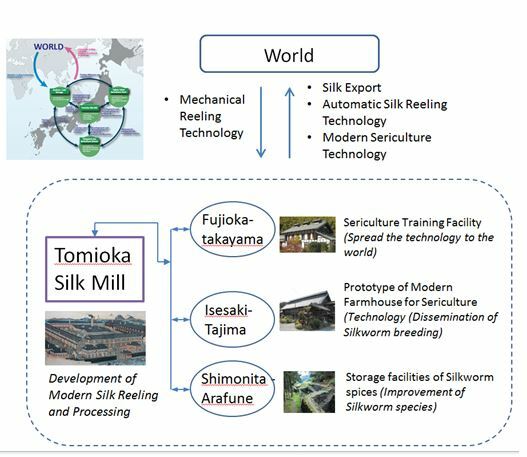 The Tomioka’s silk contributed much to develop the modern manufacturing silk technologies in the world, not only in Japan. 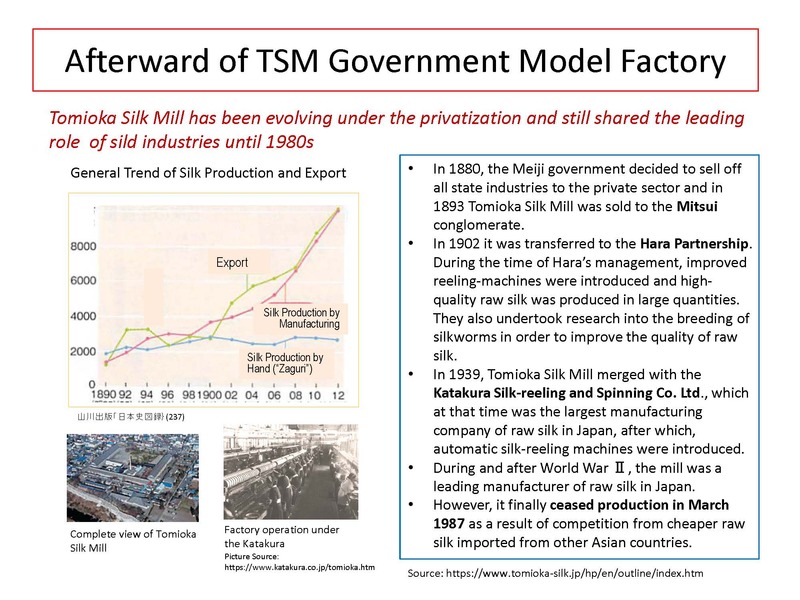 Tomioka Silk Mill has been evolving even under the privatization in 1900 and still shared the leading role of silk industries even after the world war II until 1980s. 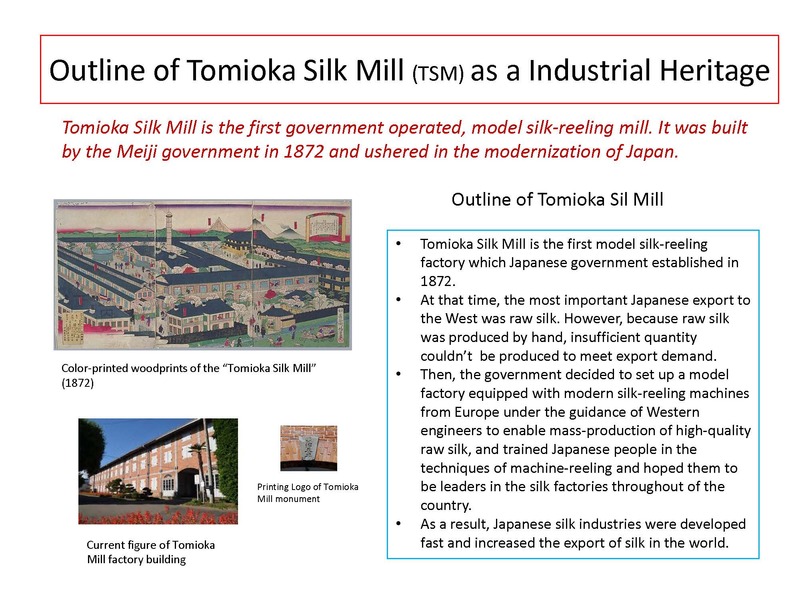 In 1880, the Meiji government decided to sell off all state industries to the private sector and in 1893 Tomioka Silk Mill was sold to the Mitsui conglomerate. In 1902 it was transferred to the Hara Partnership. 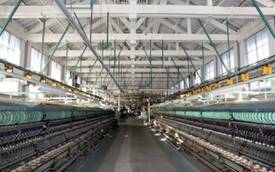 During the time of Hara’s management, the improved reeling-machines were introduced and high-quality raw silk was produced in large quantities. 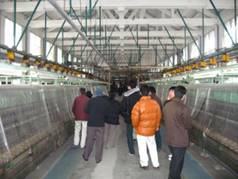 They also undertook research into the breeding of silkworms in order to improve the quality of raw silk. 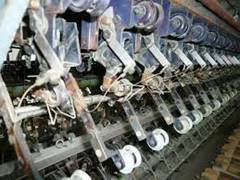 In 1939, Tomioka Silk Mill merged with the Katakura Silk-reeling and Spinning Co. Ltd., which at that time was the largest manufacturing company of raw silk in Japan, after that, automatic silk-reeling machines were introduced. 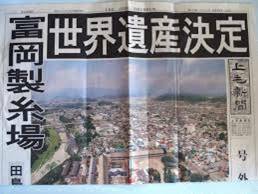 During and after World War Ⅱ, the mill was a leading manufacturer of raw silk in Japan. However, it finally ceased production in March 1987 as a result of competition from cheaper raw silk imported from other Asian countries. 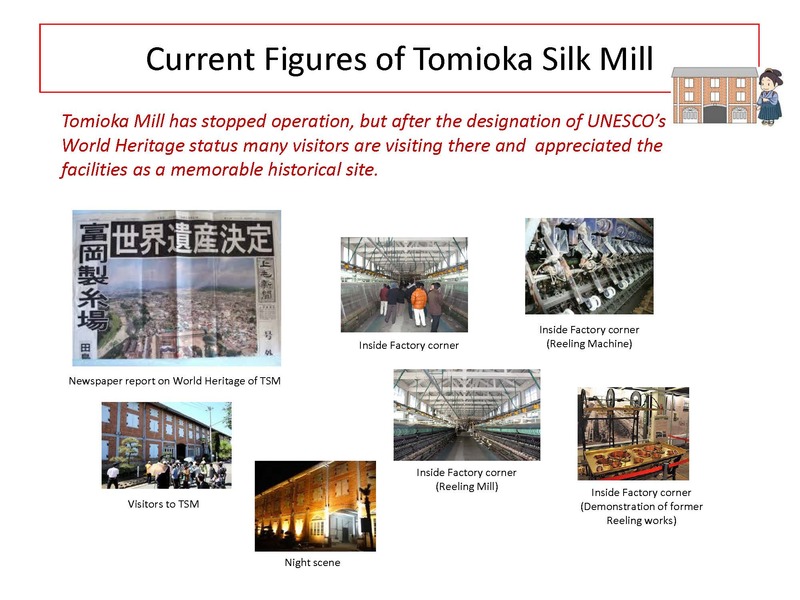 Tomioka Mill has stopped operation, but after the designation of UNESCO’s World Heritage status many visitors are visiting there and appreciated the facilities as a memorable historical site.